Raggedy Creek Ranch is owned and operated by Rusty & Malinda Moore. Situated on the Rolling Plains of Northwest Texas we offer some of the finest Texas hunting for whitetail deer, turkey, quail, wild hog and some species exotic game available. The main Ranch is located just a couple of miles north of Crowell, Texas. It sits in the cedar and mesquite covered hills and canyons that make up the rugged terrain of the Pease River country of Foard County, Texas. Rocky bluffs, canyons and thick creek bottoms make for a challenging hunt for all sportsman. We manage over 10,000 acres of the best Texas has to offer hunters. We are a complete hunting Ranch, offering hunts with a rifle, bow hunting and black powder. 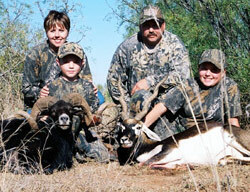 Raggedy Creek Ranch maintains a variety of Native and Exotic game which are managed for trophy proportions. 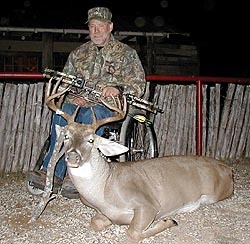 Our semi guided Texas whitetail rifle hunts are conducted on various area ranches. We can accommodate individual hunters as well as groups of hunters. All exotic hunts are fully guided and are conducted safari style or by stalking on foot. We keep an assortment of trophy class Corsican, Mouflan, Black Hawaiian and Merino rams, and Red deer within the high fenced portion of our Exotic hunting ranch. Other hunts are semi-guided from heated box blinds and tower stands. Our guides will see that your hunt is enjoyable and safe as well. We don’t charge daily guide fees but if your guide has done a good job and you feel a tip is in order, it would be greatly appreciated. If you hunt as a family, then this is the place you will want to come. We pay special attention to children. Everyone at Raggedy Creek Ranch will go the extra mile to see that a child has the true Texas hunting ranch experience of a lifetime. We are aware that the future of hunting lies with the children of today. Be sure and ask us about our Youth discounts and “Texas Special Youth Season Hunts”. We have several different hunting packages available, take a look around our site and you are sure to find one that fits your needs. Please contact us if you have any questions or comments. Thanks for visiting the Raggedy Creek Ranch web site. Please return soon!